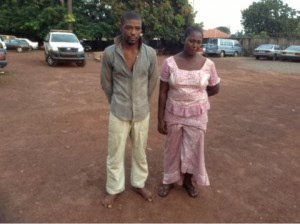 Enugu State Police Command has arrested a house wife who stage-managing her own kidnapping and demanded for N200, 000 (Two Hundred Thousand Naira) ransom from her husband Marcus Chukwu . Mrs Nancy Chukwu and her collaborator, Chikwe Tochukwu had called Nancy 's husband, Marcus, that she had been abducted by unknown gunmen and that her abductors were demanding the sum of two hundred thousand Naira. The suspects thereafter gave Marcus an account number where the said ransom is to be paid. Dailypost reports that, instead of paying the ransom, Marcus reported the matter to the anti-kidnap unit of the police. The police spokesman in Enugu State, Ebere Amaraizu, DSP, who confirmed the incident disclosed that investigations conducted revealed that Tochukwu of Amakwe Okeremiri Aboh Mbaise in Imo state, residing at Agbogugu was the brain behind the stage managed kidnap, which was aimed at reaping off the woman’s husband. In his confession to the police, Tochukwu said he is an okada rider that usually conveys Nancy home anytime she is returning from market, adding that Nancy lured her into the crime. He further confessed that while he was together with Nancy, he used a tone suggestive of a kidnapper already holding Nancy under captivity, and demanded that the sum of two hundred thousand Naira is to be paid as a ransom to the account number provided, which he also claimed belonged to his friend Chikwado. Looking at the whole scenario, one would be tempted to ask if their relationship was further than Okada and passenger's type to infidelity. For a woman to collude with an outsider to defraud her husband is more than the ordinary, it speaks volumes.